Laila’s father was the king of her Middle Eastern country. After his assignation in a coup by her Uncle, Laila, her mother, and younger brother are flown to America. Exiled from her home Laila has to navigate American high school, shifting loyalties, and must decide if she wants to return home. Throughout the novel I was impressed with Laila’s character development. She goes from being a princess to living in an apartment. She handles all of theses changes with little whining or feeling sorry for herself. I admired her ingenuity and determination to do the right thing even after finding out the atrocities her father committed. The Tyrant’s Daughter is ripe with difficult subject matter including civil war, bombings, and death. I really appreciated how Carleson handled it. She didn’t lay blame or choose sides Carleson merely presented facts. One of the things I didn’t like about this novel was that Laila’s country of origin is never mentioned by name and is left to be vague. In the authors note Carleson says this is because she didn’t want to be leashed to a particular setting or events but I felt like the story lost something in all the vagueness. 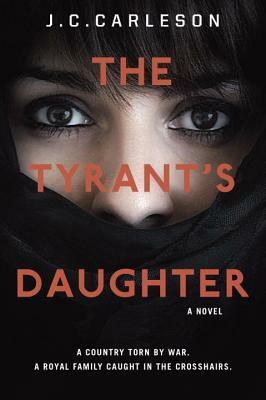 Overall, I enjoyed The Tyrant’s Daughter it is very well written and incredibly interesting. I don’t think it has gotten nearly enough attention and if you’re looking for a political novel I wouldn’t hesitate to pick this one up. This sounds like an exciting book, have not heard of the author or the book but this I must check out sometime. You're right, this one kind of flew under the radar but I really enjoyed it! I hadn't heard of this book until now, so I think it is pretty cool that you read and reviewed this. Thanks for introducing it to me! It seems like one for my TBR as well, because I love character development. I'm intrigued! An interesting "fish out of water" viewpoint. I like reading about other cultures, as well.